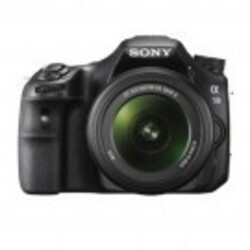 Packed with a number of excellent features, this Sony A58 DSLR Camera with 18-55mm Lens, Black give you the best in photography. The A58 houses a 2.7 inch 460x800 pixels resolution TFT LCD monitor allowing you to frame your shots. It is perfect for capturing everything from stills to videos in all types of lighting. Not only this, but its low pass filter employed to capture subjects of high detail and maximum sharpness, make it your number one choice for landscape photography. Bring vibrant scenes to life. Capture decisive moments like a true professional. The Alpha a58 unites high end camera technology with innovative new features and user friendly operation to enable comfortable, carefree shooting with impressive results. Every curve and detail of its sophisticated body has been painstakingly refined to enhance your handling ease. Whether shooting photos or Full HD video1, it's now easier than ever to elevate your images with the refinement and creative freedom of interchangeable lens photography. The Alpha a58 features a 20.1 megapixel Exmor HD APS sensor for lavishly detailed photos that make for gorgeous enlargements not to mention Full HD video of incredible richness and clarity. Thanks to the large APS-C size sensor and premium Sony Exmor APS HD CMOS technology, the camera achieves high resolution with no penalty in low light sensitivity or sensor noise. And with continuous shooting of up to 5 fps, you'll never miss a moment. Unlike other DSLRs, the a58 captures up to 5 fps at full 20.1 megapixel resolution with continuous autofocus thanks to the power of Sony's award winning Translucent Mirror Technology. This groundbreaking technology directs light to both the image sensor and Phase Detection AF sensor simultaneously for enhanced autofocus performance plus blazing speed and precision. Record stunning, high-quality movies at Full HD 1920 x 1080 resolution in either 60i or 24p frames per second (records in 29 minute segments). Choose the AVCHD codec for exquisite Blu-ray Disc picture quality, or record in the PC friendly MP4 format which lets you compress files for easy upload to sites like Facebook and YouTube. Lock on AF for enhanced focusing. When shooting quick moving subjects think kids playing soccer or a seagull in flight it can sometimes be difficult to maintain a crisp focus. Using Sony's Translucent Mirror Technology and advanced Face/Object Detection, Lock on AF continuously adjusts the target frame size based on various subject characteristics and dramatically increases the in focus rate. Even if your subject's face cannot be detected, the Lock-on AF ensures smooth, stable focusing using the optimal AF point without having to search. High ISO sensitivity, low noise. With a new Exmor sensor that features the same adaptive noise reduction technology found in Sony's flagship Alpha a99 camera, the a58 offers a wide range of sensitivity, from ISO 100 all the way to ISO 16000. Your photos and video will shine with noticeable crispness, clarity and reduced graininess even in challenging shooting conditions. Give your photos a professional look with the help of Auto Object Framing. Featuring advancements like exceptional two person portrait capability along with Face Detection and Tracking Focus technology, Auto Object Framing turns ordinary photos into beautifully balanced compositions by automatically recognizing the scene then cropping accordingly. It's an effortless way to achieve perfectly framed photos every time. Discover, Experience and Buy a range of products at Reliance Digital. Discover 150 international and national brands and over 4000 products. Experience the best potential of each product in an ambience that simulates your life style. Not only do we enable you to make an intelligent buying decision, but also offer complete product life cycle support – ResQ – our proprietary advisory and post-sales support service. Choose products from the best of brands –from Sony, LG in Home Entertainment, and Nokia, Samsung in mobile phones, to Panasonic, and Toshiba in Home Appliances. Discover products that best suit your lifestyle needs and provides best value for money in terms of TCO (total cost of ownership). Touch, feel and try every product before you make your BUY decision! Get Up, Close and Personal with the latest products in our specially designed Experience Zones for high-end entertainment systems like home theatres, televisions, home and car music systems. These zones simulate an environment that brings the best of each product alive – thereby guiding you to make the right choice. Bought that big smart TV and don't know where best to place it in the room? Or have a device malfunction/breakdown and hassled about setting it right? Be it product installation, break down or maintenance - Trust ResQ to bail you out! Our ResQ personnel shall personally visit, rectify, and provide you with a step-by-step guidance for maintenance till the life cycle of the product. ResQ services are available to support 7 days a week, from 10 A.M to 10 P.M. Simply walk into any of our stores to discover and experience all that Reliance Digital has to offer!